Gas cylinder storage poses great risks and can create hazards such as fires, explosions, toxic gas exposures and oxygen displacement. Compressed gas must be handled and stored properly and safely in order to remain from becoming volatile or creating a hazardous situation. If a compressed gas cylinder becomes ignited it has a high risk of exploding and harming personnel. It is necessary to avoid all hazardous situations to store gas cylinders properly. It all depends on the type of cylinder, it’s contents, and the nature of the site. OSHA rules are different for storage depending on construction sites and general industrial settings. Using a gas cylinder storage rack for all gas cylinders can prevent and greatly reduce hazardous situations. 1. Keep gas cylinders stored in a cool, dry atmosphere: Store gas cylinders away from flames, sparks, and areas that can exceed 125°F or temperatures that are stated on the label. Use a gas cylinder storage rack to keep cylinders maintained, away from doorways, aisles, elevators, and stairs. Grouping different chemical gases by their hazardous classes will provide for a safer storage environment. A gas cylinder storage rack can offer an organized way to store cylinders. Many gas cylinders can be stored on their sides, but there are some gas cylinders that must be stored vertically. Acetylene cylinders are flammable and can create a hazardous situation if they are not stored upright. 2. Gas Cylinder Storage Rack – Solid Anchoring: Storing gas cylinders with a gas cylinder storage rack can prevent cylinders from falling over. This could lead to an injury involving personnel or other bystanders. 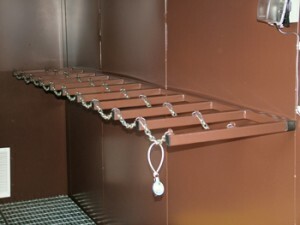 Keep gas cylinders from harming personnel with a heavy duty storage rack by US Chemical Storage. 3. Examine Before Using – Check the gas cylinder for dents or any noticeable damage. Make sure that the gas cylinder has a proper label describing the contents stored inside before opening. Inspect the cylinder’s regulator and cylinder valves to make sure the cylinder has not been tampered with. Use a cart when transporting the cylinder – dragging or rolling the cylinder can cause damage and disturb the gas inside. 4. Open Valves with Caution & Closing Valves Properly: Opening valves too quickly can damage the regulator and valve seats. Open valves slowly with the correct tools. Do not use tools that will compromise the valve. If the valve seems to have been tampered with, do not open the cylinder, leave the cylinder on the gas cylinder storage rack, until it can be inspected by authorized officials. If a valve is stuck, do not use lubrication or oil to release it. This can cause a reaction from the gases stored inside the cylinder. Closing valves properly: Close valves completely to avoid moisture build up or other contaminants from entering the tank. Replace the protective cap and label the gas cylinder “EMPTY”. Store the empty cylinders in a gas cylinder storage rack, grouped as “EMPTY” cylinders. Understanding proper gas cylinder storage can prevent hazardous situations and provide a safe working, and storage atmosphere. Learn with US Chemical Storage about safe chemical storage solutions. Our Strength is Your Security.